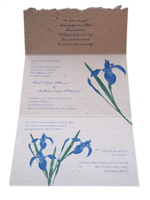 GreenFieldPaper.com has always provided the latest in eco-friendly paper products and now that moves on towards wedding paper. Our unique wedding invitations and accessories are the best looking on the web and for the environment. All of our products include quality workmanship and 100% natural and recycled materials.